Book a trip to your new local indie cinema on Wed 11 Sep @Beckenham and taste some FREE local ice cream! …Happy 1st Birthday to US! Imagine a robot who can cook, clean, do the garden, monitor your blood pressure, keep you healthy… and out of trouble. ‘Robot & Frank’ is a gentle comedy which reflects on the theme of memory. Frank Langhella’s performance is dry and low-key as a recalcitrant jewel-thief who won’t grow old gracefully, ably supported by Susan Sarandon, Liv Tyler and James Marsden. A great script and story – we know you’ll enjoy our opening film – click on the poster to your right on the sidebar for the trailer. Tickets only £7 non-members (£4 members) – age 16+ only. Limited availability and tickets not available on the door – seating non-allocated in Studio 609 (seats 84). Robot & Frank – a classy little film to make you smile. FREE parking, no popcorn mess, free film notes to take away and a brief introduction to the film. Refreshments are available from 6.40pm and the programme begins at 7.30pm. Our ‘special feature’ local food tasting will be by Drunken Dairy, from SE20 – a unique concept of delicious ice cream and sorbets for grown-ups. The producers will join us before the film so that you can taste their range, which you can see at https://twitter.com/DrunkenDairy (new website under construction). Coming up on Thursday 26 September... Booking is also now open for Hitchcock’s legendary masterpiece, ‘Vertigo’ (Cert PG) with James Stewart and Kim Novak – on our HUGE screen in the Bromley Hall – it will look and sound superb in this space and is rarely seen on the BIG screen anywhere. Films really are better with an audience so do come and join us for this special treat to mark our 1st Birthday! Under 16s very welcome. Allocated seating. Book at: http://www.TicketSource.co.uk/FilmboxCommunityCinema – Tickets £8 (members £5) – refreshments from 6.30pm and film programme starts at 7.30pm. 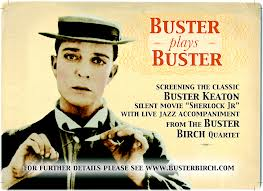 Coming up on Friday 27 September… another special treat, ‘Buster Plays Buster’ – international jazz musician Buster Birch and his quartet accompany Buster Keaton’s 1924 silent classic, ‘Sherlock Junior’ (Cert U) – under 16s very welcome. Book NOW at http://www.TicketSource.co.uk/lpcpa – Tickets £10 and £6 concessions. Starts at 7.30pm. Allocated setaing. Coming up on Saturday 28 and Sunday 29 September – our FREE 1st Birthday film festival – films for everyone! Full details on our website. Heavens to Betsy, we’ve just been shortlisted for a national award – Best New Film Society!